In the latter half of the 1990s, and into the first couple of years of the new millennium, we carried out some ground-breaking research into chemical communication within mushroom fruit bodies. Because we were hoping to commercialise the research, the work was never published beyond initial patent applications. We believed at the time that we had devised methods to gain access to at least some of the chemical signals that control fungal morphogenesis. We developed a method (the basis of a patent application at the time) to extract compounds which caused mushroom stipes to bend at the point of application within hours of treatment. Using standardised bioassays we made a start on purifying and chemically characterising the extracted substances. We worked with two components which had recognisably different activities in the bioassay. These we called Fungiflex 1 and Fungiflex 2. Our extracts caused (vertical) mushroom stipes to bend towards a drop of the extract within 1 hour of its application to the side of the stipe. This (essentially a localised growth inhibition) was Fungiflex 1 activity. Such stipes grew back to the vertical in about 9 hours, but then started bending in the opposite direction at the point of application of the drop. By 18 hours the stipe had bent to an angle of 90° from the vertical. This (a localised growth promotion) was Fungiflex 2 activity. The following figures illustrate the standard bioassay. The standard fungiflex bioassay. Treatment of vertical stipes of Coprinopsis cinerea with crude stipe extract. A drop (5 μl, = 2.5 mg) of extract was placed on the left-hand side (LHS) of stipe A and on the right-hand side (RHS) of stipe C. A drop of distilled water (control) was placed on the LHS of stipe B. Treated stipes (A and C) bent towards the extract drop within 1 h of application whereas the control stipe did not bend. By 2 h after application, the treated stipes were bent 30-40° away from the vertical (stipe A to the LHS and stipe C to the RHS) and towards the drop. Bending towards the applied drop was called Fungiflex 1 activity. The control stipe was bent only slightly (no more than 10°) from the vertical. Fungiflex 1-type bending persisted but by 3 h the apices of the treated stipes had started to return to the vertical in response to gravity. By 6 h stipes B and C were more or less vertical; stipe A had not only returned to the vertical but had continued bending past by 20°. After 18 h, the control stipe (B) was still vertical but stipes A and C were bent away from the applied drop by more than 180° and 140°, respectively. 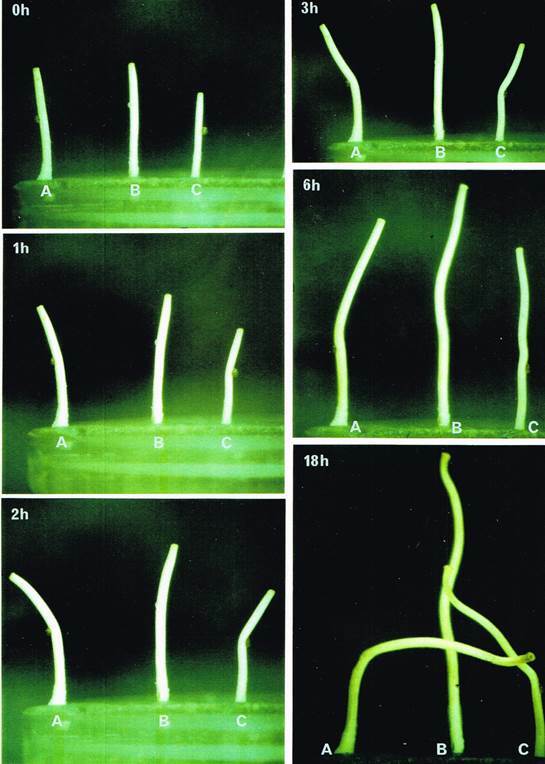 Bending away from the applied drop was called Fungiflex 2 activity. Control stipes often swayed slightly from one side to another during the observation period but they did not bend by more than 10° and in 90% of the bioassays did not bend by more than 5° from the vertical. 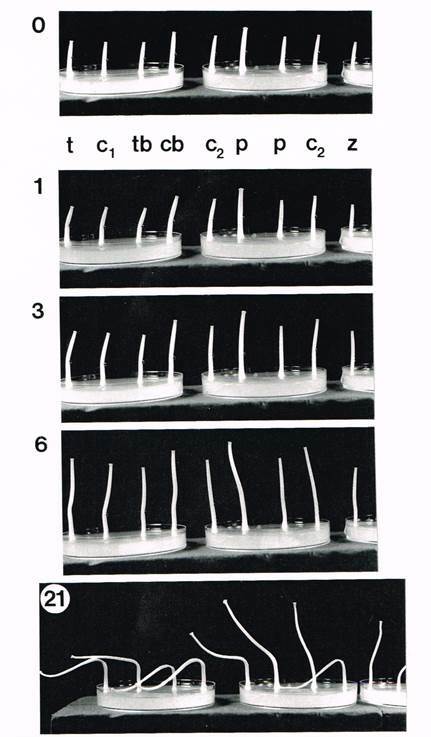 In all of the experiments that follow, the experimental approach shown in this figure was used as a standard bioassay to detect and monitor Fungiflex activity. Use of the bioassay to assess the effects of enzyme digestion on the Fungiflex extract. Bioassay of cap and mature primordium extracts together with trypsin-digested cap extracts. One drop (5 μl = 1.25 mg extract) was applied to the RHS (right hand side) of each stipe. Numerals at top left of each panel show the hours elapsed since the start. Labelling key: t = trypsin-digested cap extract; c1 = cap extract control (cap extract treated in the same manner exactly as the trypsin digest, but excluding the enzyme); tb = trypsin-digested and boiled cap extract; cb = boiled cap extract control; c2 = crude cap extract; p = crude extract from mature, differentiated but pre-meiotic primordia; z = distilled water. Slight Fungiflex 1 activity (bending towards the applied drop) was observed in cap extracts (at t = 1 and 3 h) but none was observed in the primordium extracts, although in all other bioassays, Fungiflex 1 activity was present in primordium extracts as well (data not shown). By 6 h after application, stipes had begun to bend in the other direction (that is, away from the drop), characteristic of Fungiflex 2 activity. After 21 h, stipes treated with cap and primordium extracts were bent away from the applied drop significantly. The control stipe was bent only slightly. Extracts from mature primordia exhibited slightly less bending activity than extracts from mature stipes (shown in the upper figure on this page) and caps (t = 21 h). Extracts from pre-meiotic, undifferentiated primordia contained Fungiflex 1 activity but no Fungiflex 2 activity (data not shown). Fungiflex 1 and 2 activity was observed in cap extracts from all four treatments. Trypsin digestion, with or without boiling, had no effect on the activities of either Fungiflex 1 (t = 1-3 h) or 2 (t = 21 h). Sadly, although this research got us close to understanding the structure of these first fungal hormonal compounds we were unable to secure sufficient funding to complete the isolation, purification and chemical identification of the growth factors involved. Nonetheless, the scientific knowledge we revealed is still important and worthy of publication. Our research has not lost its uniqueness, nor has it been duplicated up to now. In these pages we report in summary the research we accomplished nearly 20 years ago in the hope that it might stimulate future research in the topic and prompt further advances. In the near future, COMPLETE details of our research will be made available for purchase in the form of a printed book and as a PDF download. You will soon be able to use these publications to assess the quality of our research, to understand the methods used and to repeat and extend our work. You could pick up the research where we left off. You could make yourself a fortune! And if you do, please remember where you got the idea!